“With numerous projects going on in the northwest part of Europe and with a strong and dynamic industry in the Benelux-region, we had high expectations but these figures are really extraordinary,” commented IAAPA’s vice-president of European operations, Karen Staley. 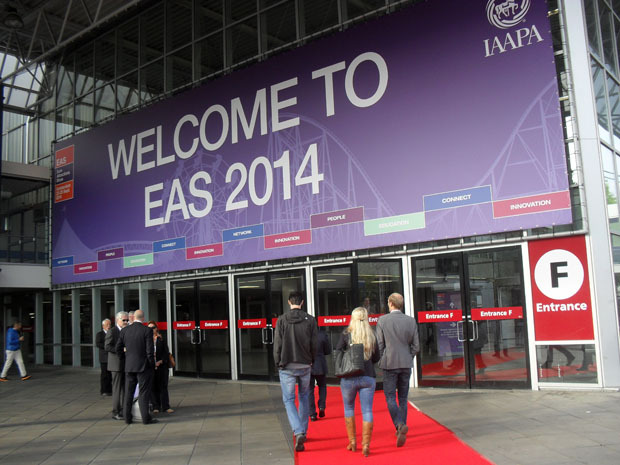 As in 2009, when EAS last visited the Dutch capital, the venue was the RAI exhibition centre but this time there wasn’t enough room beneath the main hall’s arched roof to accommodate all 441 exhibitors (about 50% up on five years ago) and so both halls 7 and 8 were used instead. Add to this a packed education programme, some great networking opportunities, parties and tours, and there was plenty to see and do for the roughly 10,750 industry professionals (up 26% on last year in Paris) that attended from 23 to 25 September. Around a third of that total were Dutch, but in total over 100 countries were represented. For those coming from outside Europe, the opportunity to combine EAS with the official post-show tour to attractions in the Netherlands and Germany, or perhaps a large event like Munich Oktoberfest, provided a particularly appealing option. It was a nice gesture too for 16 of IAAPA’s Dutch member facilities to offer free admission to EAS badge holders after the show. Behind-the-scenes tours were offered in advance of the exhibition at Efteling, Walibi Holland and the Dolfinarium. 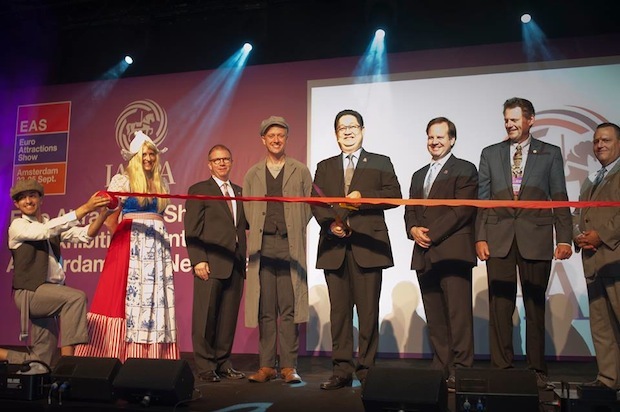 As well more than 20 hours of seminars staged during the show, EAS also featured the IAAPA Institute for Attractions Managers, the IAAPA Safety Institute, a Young Professionals Forum, a forum for waterpark operators and a symposium for indoor playground/family entertainment centres. IAAPA Europe chose this year’s EAS as a platform to officially launch its new manifesto, which has been prepared in anticipation of the arrival of a new European Commissioner for Tourism. Safety remains the parks and attractions industry’s top priority, but fair tax rates across Europe, fair competition between public and private sector attractions and easier access for “third country” tourists would all help IAAPA’s members perform better, creating new jobs and investment. As the continent is so strong when it comes to ride manufacturing, much of that investment would stay in Europe. A more detailed report on the manifesto will appear soon in Park World. Plopsa Group CEO Steve Van den Kerkhof delivered Wednesday morning’s EAS Leadership Breakfast, explaining how the intellectual property of Studio 100 has allowed him to build a five venue chain of parks in Germany and the Benelux – with more on the way. In fact, we learned during the show of the first Plopsa park to be licensed in Poland and, at another press conference, of the ambitious Park21development being planned in Haarlemmermeer near Amsterdam’s Schiphol Airport. After last year’s fantastic EAS Opening Reception at Museé de Art Forain in Paris, IAAPA had a hard act to follow with this year’s event on Tuesday night. 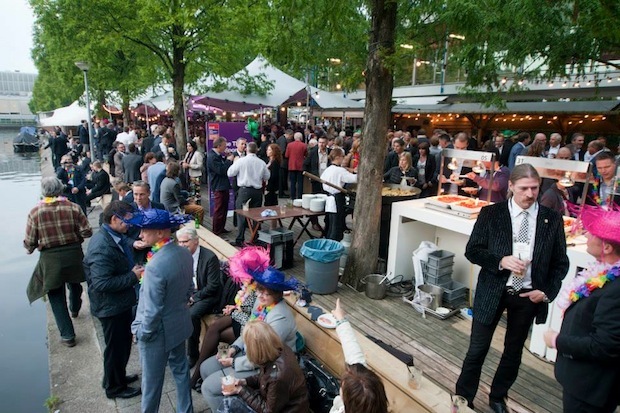 The party at Strandzuid, a beach-themed venue in the heart of the RAI grounds, was not quite on the same level but was nevertheless an enjoyable and well-attended event, as the reception always is. As well as the European Star Awards ceremony at the Heineken Experience, there were also receptions from Club van Elf, ALES-UK and the TEA, which took over Madame Tussauds in Dam Square on Wednesday evening. 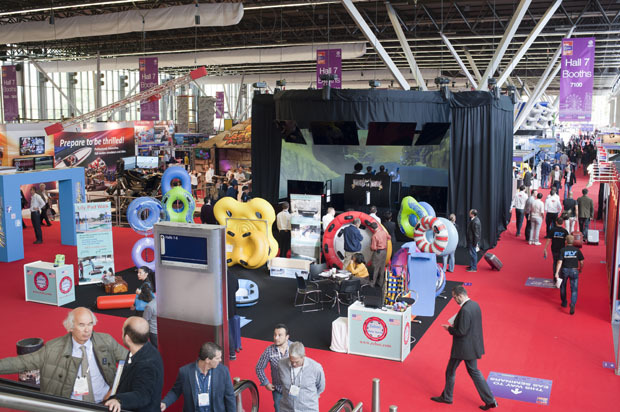 The stratospheric attendance enjoyed by EAS this year in Amsterdam meant that Europe’s largest trade show for the theme park and attractions industry is getting close to half the size of the annual IAAPA Attractions Expo in Orlando. Credit must go to Karen Staley and the team at IAAPA Europe, whose new senior manager Pablo Moragrega was attending his first EAS in such a capacity. Comments like that above about “slow” attendance reflect the fact that, even with several thousand people in the show at one time, once you spread them out over the two halls, restaurant/meeting area and conference rooms, you could soon loose them. Clearly it would have been better if the exhibits were all contained within one hall, but it’s great that Euro Attraction Show is now so big as to offer the visitor this much choice. EAS 2015 will take place from 6 to 8 October at the Swedish Exhibition and Congress Centre in Gothenburg – just across the road from Liseberg amusement park, which is expected to feature strongly in the week’s programme of events. •2005: Vienna, “More than 7,200”. •2006: Vienna, “Less than 4,000”. •2007: Seville, “More than 7,400”. •January 2008: Nice, “More than 5,000″. •Sept/Oct 2008: Munich, “More than 5,000”. •2009: Amsterdam, “More than 8,000”. •2010: Rome, “More than 9,000”.